Students from a small, private, religious college and a large, public university completed questionnaires asking their perceptions of academic dishonesty at their institution. The questionnaires used a 5-point Likert scale to determine whether the students felt it was acceptable to cheat for a specific reason such as plagiarizing or copying homework both using and not using technology. Between fall 2005 and fall 2013, 1792 usable questionnaires were collected using similar methodology, questionnaires and respondents to control for possible extraneous variables. 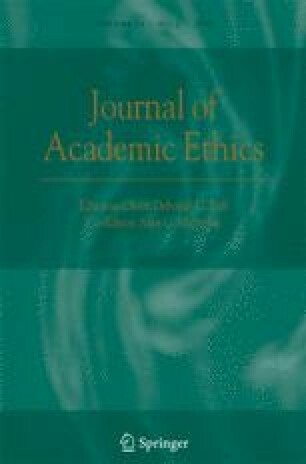 An analysis of the data provides indications that student acceptance of many types of academic dishonesty has decreased over the past 9 years. Callahan, D. (2010). Academic Dishonesty: Studies and Reports, 1915–2010. Resource document. Cheating Culture. http://www.cheatingculture.com/academic-dishonesty/2010/10/7/academic-dishonesty-studies-and-reports-1915-2010.html. Accessed 20 Jan 2015. Intellectual property. (n.d.). Merriam-Webster’s online dictionary (11th Ed.). Retrieved from http://www.merriam-webster.com/concise/intellectual%20property. Accessed 20 Jan 2015. Josephson Institute. (2010). Josephson Institute 2010 Report Card on the Ethics of American Youth, Resource document. Josephson Institute. http://charactercounts.org/pdf/reportcard/2010/ReportCard2010 data-tables.pdf. Accessed 20 Jan 2015. Josephson Institute. (2012). Josephson Institute, 2012 Report Card on the Ethics of American Youth, Resource document. Josephson Institute. http://charactercounts.org/pdf/reportcard/2012/ReportCard-2012-DataTables.pdf. Accessed 20 Jan 2015. Koch, K. (2000). Cheating in Schools. Resource document. CQ Research Online. http://library.cqpress.com/cqresearcher/document.php?id=cqresrre2000092200 &type=hitlist&num=2. Accessed 20 Jan 2015. Lang, J. (2013). Cheating Lessons, Part 3. Resource document. The Chronicle of Higher Education. http://chronicle.com/article/Cheating-Lessons-Part-3/141141/ . Accessed 20 Jan 2015.